Daily Mirror - Are Asian currencies at risk from currency turmoil in Argentina, Turkey? Two major emerging markets—Argentina and Turkey—are currently experiencing a bout of financial instability against a backdrop of rising US interest rates. 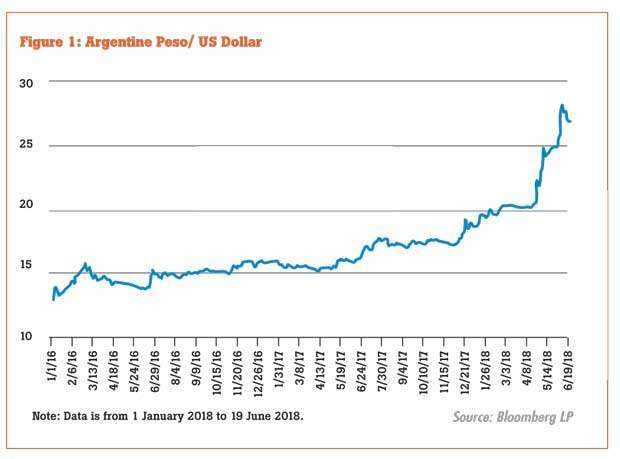 The instability is evident in the sharp depreciation of the Argentine peso and Turkish lira since the beginning of the year (Figures 1 and 2). Weak fundamentals such as high inflation and sizable current account deficits have contributed to the erosion of investor confidence in the two economies. There are growing concerns that tightening global liquidity conditions may adversely affect the financial stability of emerging markets, including Asian economies. We briefly assess the likelihood that Asian economies may also suffer financial stress in the face of higher US interest rates and a stronger US dollar. Our assessment suggests that Asia’s strong fundamentals limit this danger. Argentina’s economy has experienced severe macroeconomic instability – with high inflation, fiscal and current account deficits. This has been caused by government subsidies, printing money to finance the deficit, export taxes, currency controls that inflated the peso and whitewashing of statistical indicators that confused markets. The loss of access to credit markets when Argentina defaulted in 2001 also burdened the government finances. Argentina’s government, which took office in December 2015, is taking a gradualist approach to restoring fiscal sustainability by lifting the currency controls, removing subsidies and repaying its debts to restore macroeconomic stability. Due to these reforms, the peso was allowed to float to its true level. It has depreciated more than any other currency in 2018, as investor confidence continues to erode. Argentina’s central bank actively defended the peso by using its foreign exchange reserves and by raising its key policy rate three times in a week (April 27, May 4 and May 5) to reach 40 percent. The peso got a significant boost on May 16 following the successful rollover of US $ 26 billion worth of short-term, peso-denominated securities known as Lebacs. However, the rate hikes and the rollover seem to be temporary defences. The peso slid again, hitting 28.45 per dollar on June 15, forcing the new economy minister to announce a revised ceiling of 28-29. 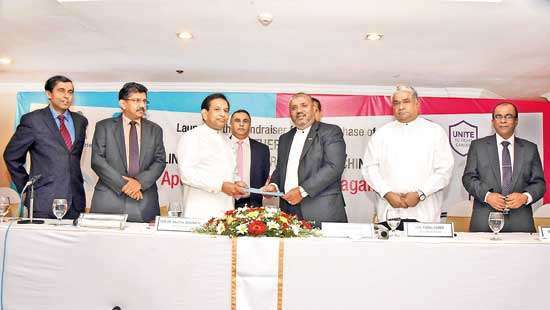 The government finally turned to the International Monetary Fund (IMF) and reached an agreement for a US $ 50 billion rescue stabilization package on June 8. The IMF package may calm the markets and provide the much-needed foreign reserves replenishment with its first disbursement of US $ 15 billion. 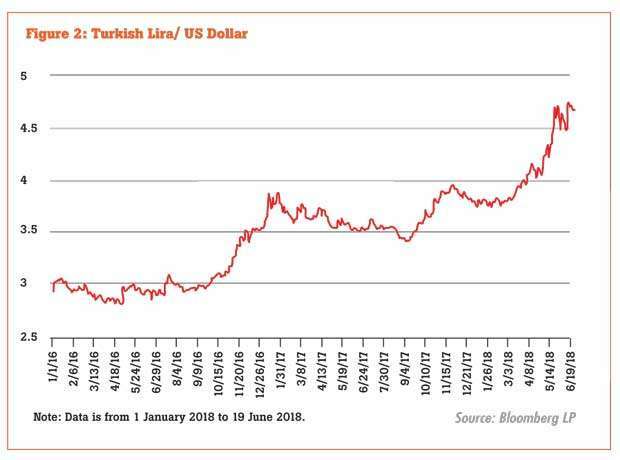 Another falling emerging market currency is the Turkish lira. 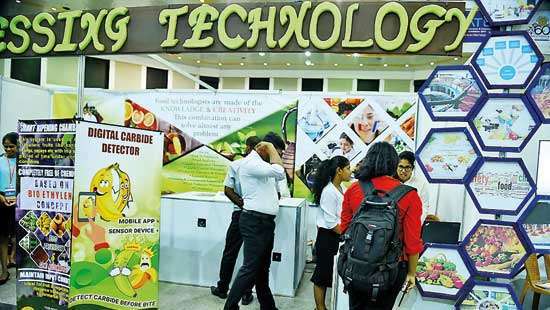 Its sharp depreciation, combined with rising energy prices, pushed inflation into double-digit territory which eroded investor confidence, prompting credit-rating downgrades from Moody’s in March and Standard & Poor’s in May. Policy rate hikes implemented in April and May failed to stem inflation and prevent a further currency slide amid market uncertainty over the direction of monetary policy. The central bank announced a plan to simplify its multi-rate structure to just one policy rate effective June 1 to reinforce its commitment to address inflation and to stabilize the currency. Promisingly, first quarter gross domestic product (GDP) growth was higher than expected at 7.4 percent year-on-year. 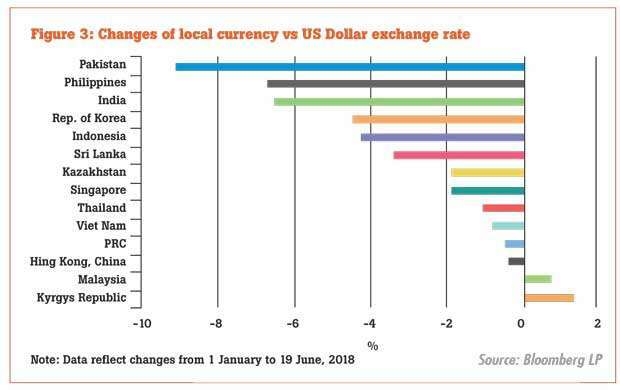 Most emerging Asian currencies have depreciated against the US dollar this year (Figure 3), driven primarily by a general strengthening of the dollar due to the robust US economy and higher interest rates. The drop has been relatively limited and largely anticipated as global investors pulled back from emerging markets seeking better returns in the US. Central banks in the region have also slightly intervened to defend their local currencies. Market-specific factors affected currencies in Indonesia, India and the Philippines. Current account deficits and inflationary pressures were some of the factors. The three countries raised their respective policy rates in tandem with the US rate hikes. On May 17 and 30, Indonesia raised rates by a total of 50 basis points; India raised rates by 25 basis points on June 6 and the Philippines by 25 basis points on June 20. Asia can thank its relatively strong economic fundamentals for its continued stability despite higher US interest rates and a stronger dollar. 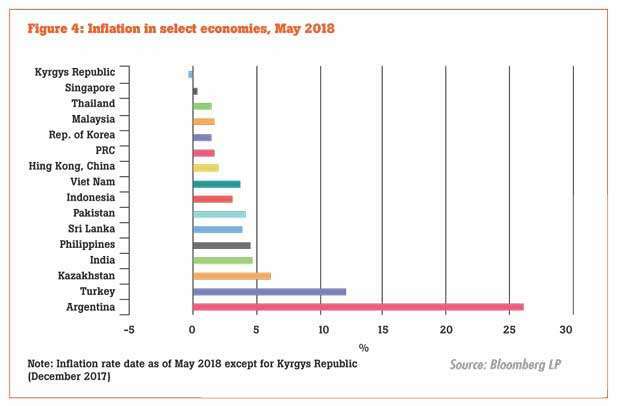 While it is true that Asian currencies have depreciated, this primarily reflects the broader strength of the dollar rather than country-specific weaknesses. 1Q 2018 GDP growth was strong, business and consumer sentiment stayed positive and inflation, a widely used indicator of macroeconomic stability, remains well below levels seen in Argentina and Turkey (Figure 4). Other indicators—current account balances, external debt, short-term reserves and import cover—show a mixed picture. Some emerging economies such as the People’s Republic of China, Republic of Korea, Thailand and Singapore are enjoying healthy current account surpluses. The Philippines, Indonesia and India have current account deficits that are well below 2 percent of GDP and are backed up by enough reserves and import cover. The risk of currency turmoil in emerging Asian economies seems relatively limited. Nevertheless, the market turbulence in Argentina and Turkey is a stark reminder that they need to closely monitor external developments, maintain strong fundamentals and keep an eye on liquidity conditions to protect financial stability. After all, the region suffered a devastating currency crisis of its own two decades ago – an event that prompted the build-up of the strong fundamentals that serve it so well today.